Wether you are and experienced angler or it's your first time saltwater fishing, we have you covered!! We offer many different types of trips- from short 4hr trips to 6hr- 8hr- 10hr- 12hr trips & multi day offshore trips. The longer the trip the further offshore we can go!! The hourly rate is $220/hr flat rate for the boat with a 20% customary tip for our mate Tom. Tom works hard for our customers enjoyment and will help everyone have an enjoyable trip!! There is a 6 person maximum on all trips - no matter if you are fishing or just riding- 6 person maximum. Give us a call or message through our website contact information to book your trip!!!! Leave the dock no later than 2pm and back the next afternoon around 6pm. Troll for Marlin, Wahoo, Dolphin the first afternoon before dark- Swordfish at night then troll and/or deep drop the next day. Leave the dock at 6am and back the second day at 6pm. Fish for Marlin, Wahoo, Dolphin during the first day & Swordfish at night. Second day we will troll and possibly deep drop for Tile fish using electric reels. Leave the dock at 6am and back the 3rd day at 6pm. Troll for Marlin, Wahoo, Dolphin & Tuna on the way out and also when we get to the oil rigs- First night we will fish for Yellowfin Tuna around the rigs- Second day we will troll for Marlin, Wahoo, Dolphin, & Tuna- Second night we will fish for tuna and/or Swordfish- Third day we will troll for marlin, wahoo, dolphin & tuna and/or deep drop for tile fish. 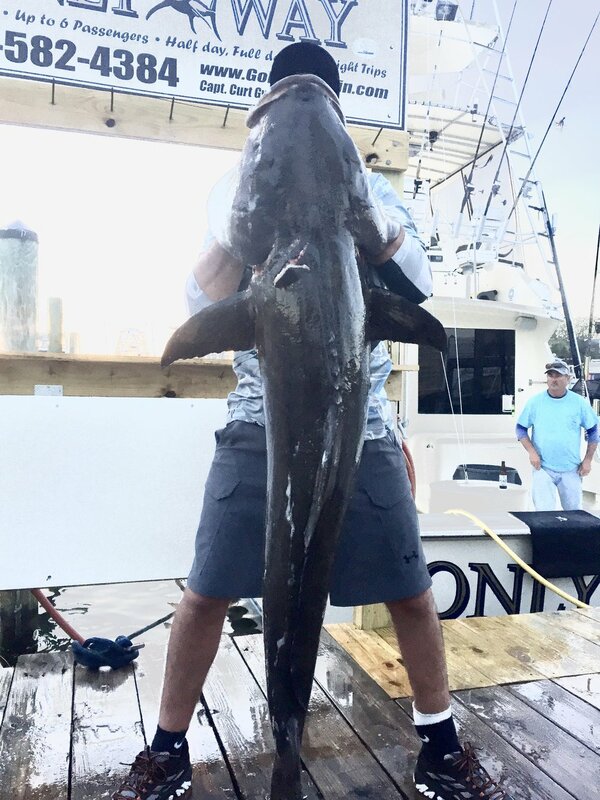 Here's a few pictures from our 2017 Cobia season!! Everyone had a tough season due to the lack of fish that showed up in the migration but we all made the best of it and fished our tails off!! We are looking forward to getting our 2017 Summer season kicked off with Red Snapper season starting June 1st and getting out into the blue water in search of big Blue Marlin! !